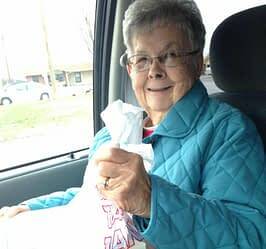 GREENEVILLE, Tenn. — Every Thursday, locals are getting meal deliveries from their friendly neighbors at Morning Pointe of Greeneville. With smiles on their faces, the assisted living residents — like Ellie Lowery — enjoy volunteering for Meals on Wheels. But these acts of kindness are nothing new to these seniors. Their generous gestures inspired a year-long campaign, as Morning Pointe residents, associates and volunteers in Greeneville and across the Southeast seek to give back 20,000 hours of community service in 2017. Photo: Ellie Lowery, Morning Pointe of Greeneville resident, delivers Meals on Wheels to locals.